My very good friends TallAsAVan and DrinkBritain kindly gave us this bottle last Christmas. They said that it was something rather special, so when the Prodigal Wean came up the road for a few days that seemed like a good occasion to open it. I could tell straight away that it was something out of the ordinary. The muzzle took nine half twists to remove. Nine, I tell ye! And take a look at that picture. Have you ever seen such a nubbly little cork, even on a bottle of gueuze? 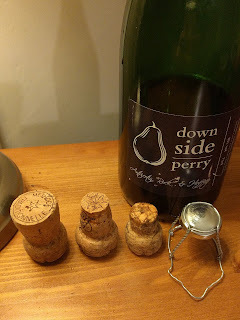 The three varieties of perry pear used for this bottling are Antricotin, Rock, and Hendre Huffcap. Gotta love perry, just for the fruit variety names! To start with I was a wee bit concerned that it seemed very bretty but that cleared off pretty quickly, so maybe it was just bottle stink. The nose was very complex, and quite intense. There was pear and elderflower, mossy sticks, a touch of what might have been spicy honey, plus fresh silage or cheesy straw. Inexplicably, the overall effect reminded me of stir fry. The Prodigal Wean liked it too - she suggested, "the fresh greenness of spring onions without the onionyness", and, "ginger?”. 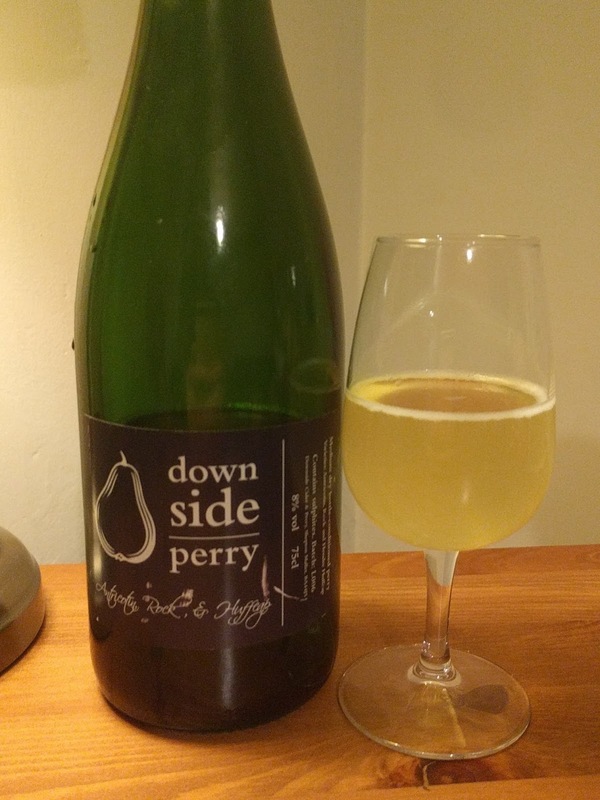 The palate was light and airy (one of the things I love about good perry - that it can be so light and yet also intense). It tasted of green apple skins, more of the green sticks from the nose, a touch of clean dark earth, and honeyed pear juice. And just to wrap it all up, there was such a lovely clean finish. Pretty much everything about this bottle was perfect. So thank you DrinkBritain & TallAsAVan for the gift, and thanks Wean, for that spring onion tasting note.